“Cubs Win World Series – Sweep Miami” reads the holographic billboard in Courthouse Square of Hill Valley. Well, unfortunately the Chicago Cubs and the Miami Marlins aren’t going to face each other in the World Series because they’re both National League teams. However, the teams did just wrap up a series of baseball games against each other in Miami. 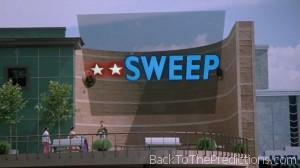 Did the Cubs sweep Miami in 2015 as predicted in Back to the Future Part II? No. While the Cubbies started strong on Monday and defeated Miami 5-1, they lost 5-2 on Tuesday and 3-7 on Wednesday. The two teams face each other again in Chicago next month.